Motion For Life Myofascial Release Clinic is located in the Northeast corner of Indiana. The clinic is located 2 miles East of Orland, Indiana. Just North of State Road 120. A landmark for the clinic road is The Garden Shed Greenhouse. The clinic road (750W) is 100-200 yards West of The Garden Shed Greenhouse. Turn North onto our road, 750W. The clinic is the second place on the left (West) side of the road. Follow the circle drive to the back - the clinic is in the lower level of the building. Just come on in and rest in the waiting area or sit outside and enjoy the view! Left at the 4-way stop and stay on that road until you reach State Road 120 (stop light). Turn West onto State Road 120 and follow until you see The Garden Shed Greenhouse. Turn left off the exit and stay on that road until you reach State Road 120 (stop light). Turn West onto State Road 120 and follow until you see The Garden Shed Greenhouse. Turn right off the exit (towards Howe) and follow that road to State Road 120 (stop light). Turn left onto State Road 120 and follow to Orland. Follow the signs to State Road 120 (stop light). Turn West onto State Road 120 and follow until you see The Garden Shed Greenhouse. 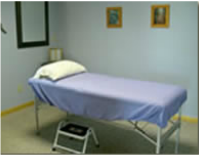 If you are coming from out of town and need to find a place to stay there are several hotels within 7 miles (15 minutes) of the clinic. There are also three campgrounds that are also close.